Geneva, 19 October 2010 — ITU’s latest statistics published today in The World in 2010: ICT facts and figures reveal that the number of Internet users worldwide doubled in the past five years and will surpass the two billion mark in 2010. The number of people having access to the Internet at home has increased from 1.4 billion in 2009 to almost 1.6 billion in 2010. The new data were released on the eve of World Statistics Day, which will be celebrated worldwide on 20 October 2010. 162 million of the 226 million new Internet users in 2010 will be from developing countries, where Internet users grow at a higher rate. By the end of 2010, 71% of the population in developed countries will be online compared to 21% of the population in developing countries. While in developed countries 65% of people have access to the Internet at home, this is the case for only 13.5% of people in developing countries where Internet access in schools, at work and public locations is critical. Regional differences are significant: 65% of Europeans are on the Internet, compared to only 9.6% of Africans. With the rapidly increasing high-bandwidth content and applications on the Internet, there is a growing demand for higher-speed broadband connections. Over the past year, there has been strong growth in fixed broadband subscriptions. 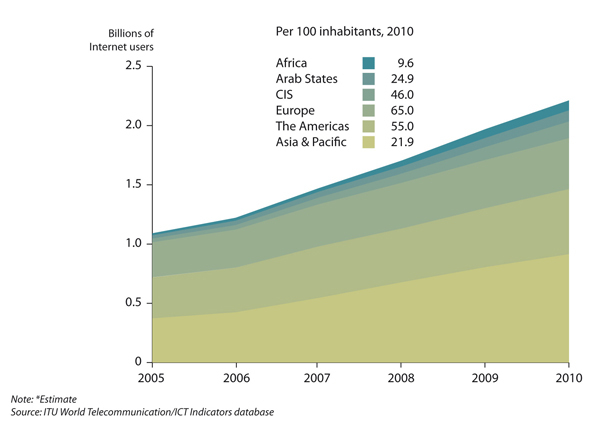 By the end of 2010, fixed broadband penetration will reach 8% globally. But penetration levels in developing countries remain low: 4.4 subscriptions per 100 people compared to 24.6 in developed countries. While high-speed Internet is still out of reach for many people in low-income countries, mobile telephony is becoming ubiquitous, with access to mobile networks now available to over 90% of the global population. ITU’s new data indicate that among the estimated 5.3 billion mobile subscriptions by the end of 2010, 3.8 billion will be in the developing world. In developed countries, growth in mobile subscriptions has slowed considerably during the past five years, with a year-on-year growth from 2009-2010 of only 1.6%. In those countries, the mobile market is reaching saturation levels with on average 116 subscriptions per 100 inhabitants. At the same time, subscriptions to IMT2000/3G services have increased from 72 million in 2005 to 940 million in 2010. As many as 143 countries are offering IMT2000/3G services commercially, up from 95 countries in 2007. Over the past year, mobile broadband has experienced steep growth, especially in Europe and the United States, and some countries have started to offer commercial services at even higher broadband speeds, moving to next generation wireless platforms. The trend from voice to (mobile) data applications is reflected in the growing number of SMS, or text messages sent, which tripled over the past three years to reach a staggering 6.1 trillion in 2010. In other words, close to 200 000 text messages are sent every second. Overall, the price of ICT services is falling, but high-speed Internet access remains prohibitively expensive, especially in low-income developing countries. In 2009, an entry-level fixed (wired) broadband connection cost on average 190 PPP$ (Purchasing power parity in USD) per month in developing countries, compared to only 28 PPP$ in developed countries. Mobile cellular services are much more affordable, with an average monthly cost of 15 PPP$ in developing countries compared to around 18 PPP$ in developed countries. The relative price for ICT services (especially broadband) is highest in Africa, the region with the lowest income levels. The region lags behind when it comes to broadband access. Although subscriptions are increasing, a penetration rate of less than 1 per cent for fixed broadband illustrates the huge challenges that persist to increase access to high-speed, high-capacity Internet. The United Nations designated 20 October 2010 (20-10-2010) as World Statistics Day. The celebration of World Statistics Day acknowledges the importance of national and international statistics and aims to strengthen the awareness and trust of the public in official statistics. Within the UN system, ITU is the main source of internationally comparable data and statistics on ICT. The Market Information and Statistics Division of the Telecommunication Development Bureau (BDT) collects, harmonizes and disseminates more than 100 telecommunication and ICT indicators from over 200 economies worldwide. Data are accessible online through the ICT Eye portal, on CD and in print publications. The Division regularly publishes analytical reports illustrating the latest trends in the sector. It monitors the development of the digital divide and has developed widely used benchmarking tools, such as the ICT Development Index (IDI). It also provides statistical training and capacity building to developing countries to improve internationally comparable data.